Returning from Thailand we needed to find an easy and safe way to move our road bikes around Northern Michigan – without purchasing new gear or messing up the minivan we were using. At first we just put the road bikes in the back of the van. It was so easy but the bikes moved around getting everything dirty and potentially knocking into passengers. The Dodge Caravan’s Stow & Go Seating (https://www.dodge.com/grand-caravan/interior.html) is the perfect solution to the minivan seat stowage problem. Leveraging the mounting options seemed to be the best way to go. Part 1 shows the easiest way to improve our storage system. It is so simple but required a couple creative insights to make it actually work. Strapping the road bike to the side wall of the wan worked very, very well. We used this simple solution most of the riding season. Near the end of the riding season I was inspired to up-the-game on the internal minivan road bike mount. I realized that the Dodge Caravan’s Stow & Go Seating system could be further leveraged to mount a bracket to the floor of the fan. I figured out how to mount a road bike stand to the van floor! Please watch both videos. They really are better methods to carry the road bikes in the van. Now to wait out the winter season by riding the bikes indoors. It’s way to cold to ride outside – at least for me as I’m missing the roadways of Thailand! How to read the Tread Wear Indicators on Continental Gatorskin road bike tires. Continental GatorSkin DuraSkin Folding Tire (All Sizes) These tires have stood up to thousands of kilometers of Thai roads in all the heat and junk that Thailand could put them up against. These are not subtle tires, nor are they especially light. But, neither have they worn out quickly. I can’t say that for the other tires I’ve used out here. How, why, where and when to use Chamois Cream – and my advice on the kind of Chamois Cream to use along with my specific brand recommendation. My favorite Chamois Cream. It comes in a tube so it stays clean and ready to use without mess. There is no extra tingly stuff in the product. The tube is good but it’s tingly. My second favorite brand. Jar and tingly. Not my favorite. Final Product Review: Garmin Edge 810 – Time to give up on getting a software update to fix the Garmin 810 crash. It does the basics but crashes when adding maps and live tracking on a real ride. The next tech purchases will be Bluetooth HR, speed, and cadence sensors to use with an old cell phone. Link to How to Crash a Garmin Edge 810 video. 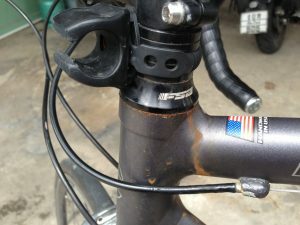 Real-life read bike sweat damage and the only two things we can do about it. Sweat has corroded and destroyed various parts of my bike. 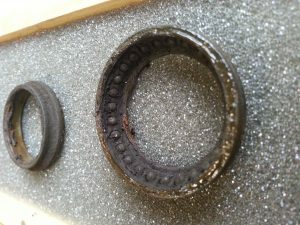 Most recently the head tube bearings. 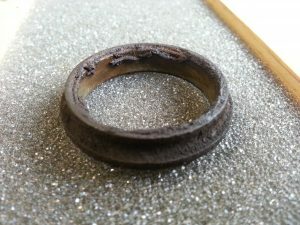 Sweat corroded head tube bearings. The only two things we can do about it is keep the sweat off the bike and clean it up after. This was a hard video to make. Rain, bugs, and the learning curve claimed my first two attempts and forced me indoors for a third. I learned about the changing sound frequencies of jungle cicadas, that it’s hard to make a video in the rain at the top of a mountain when you get their by bike, and that you should always switch to airplane mode when you shoot with an iPhone. 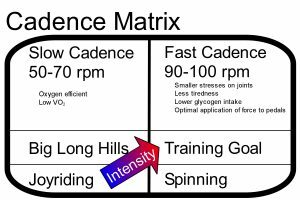 Getting a chance today to do something I love to do, that’s talk about the mathematics, physics, and physiology of bike riding. 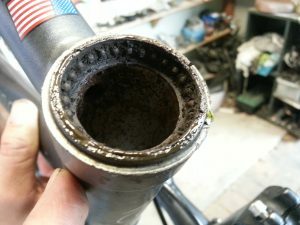 Today I want to do something that has not been done to my knowledge and that is to convert a cheap, or at least, inexpensive cycle odometer, speedometer, computer into a more expensive cadence meter. I’m going to do that by changing the way we do the measurement of the going around and around of the front wheel to going around and around of the pedal. Ken from OldManRider back in Thailand. Beautiful sunny days, middle of the rainy season now which means the rains will be coming. But, it’s great because that means the forest will be crazy green, the roads are clean, and the weather is a lot cooler. It’s just a joy to ride along the mountain tops or along the river, whatever it is. Come out and join us it’s a great place. The purpose of today is to share how to crash a Garmin Edge. This is my 810. I got it for Christmas last year. It’s a wonderful tool that I use on every ride, long and short. Besides, I need the Strava miles. But, it crashes. I go through a lot of road bike gloves and after being road bike gloves they get recycled as my motorbike gloves. I’ve just feel “safer” wearing gloves. In the Thailand heat having non-sweating hands feels better. I wear gloves when riding back in Northern Michigan. When it’s cold I wear warm lobster gloves. In my opinion, gel-filled gloves are better than gloves without padding or with simple foam padding. Gel-filled gloves are generally a bit more expensive. I’ve paid a lot and I’ve paid relatively little. Expensive does not mean good, comfortable, well made, or smart. In fact, some of the more expensive have simply stupid designs. They were obviously created by some marketing department with connections to the bicycle accessory sales chain – but not real riders.